John Wells’s phonetic blog: Ruyton how many? Q: Which English placename contains a Roman numeral? 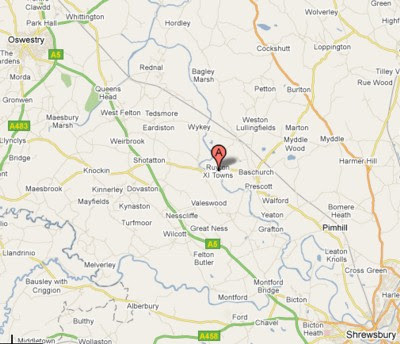 A: Ruyton-XI-Towns, a village in Shropshire. The village acquired its unusual name in the twelfth century when a castle was built, and it became the major manor of eleven local townships. The Roman numeral for eleven is included in its name. Some of the eleven ancient townships, mostly situated to the north and west of Ruyton, still survive as hamlets today. There are also mixtures of Welsh and English such as Maesbrook (Welsh maes = field). Many years ago, when driving down the A483, I needed to buy petrol and stopped at a petrol station in Llynclys. I couldn’t resist asking the pump attendant, “What’s the name of this village?”. Back came the answer: ˈlʌŋklɪs. And, I repeat, this was in England. Trefonen is trɪˈvɒnɪn. As for the others I mention above, I can find no information on how their pronunciation is anglicized, as presumably it must be. Berkshire placename Twyford as /`tuːifəd/ but that doesnt make it a Welsh-language name. that show it, like Marlborough, to have undergone dissimilative loss of its first /r/ and to contain in its first syllable a reflex of an Old English word for ‘boundary’. I don’t know how people there pronounce it but I guess it might be /`meɪzbrʊk/. "Maesbrook" is "Maesbrog" in Welsh. It's still not clear which language is mangling the other -- does it mean frog-field, or does it mean the brook near Maesbury (which is Llysfeisir in Welsh*)? I'm trying to recall how the ae/â/ê split happens in the North-East -- it won't go to "â" up there, but if it does go to "ê", then it becomes very hard to spot anglicization. The other thing to note is that the part of Wales between Oswestry and the Berwyn mountains (and therefore relatively cut-off from the rest of Wales**) is over 50% Welsh-speaking (map here). The language question isn't asked in the English census, but note that the only places where there's an consistent immediate drop from >50% to <20% are the City of Swansea and the rather extreme natural border of Ceredigion and Radnorshire (the road from Cwmystwyth to Rhaeadr is a once-in-a-lifetime experience!). I would therefore hypothesize that the reason why there isn't much information on how Welsh placenames get anglicized in this part of Shropshire is because they tend not to. The Welsh influence in Shrewsbury, where I grew up, is still very strong. It was once the capital of Wales (though now about 12 miles inside England). Many of my friends at school had Welsh as their first or second language, and in the days when the cattle market was held in the town, the streets were filled with Welsh speakers on market day. Local Welsh-derived place-names tend, not surprisingly, to be pronounced in a more or less Welsh way according to how close the speaker's connection with Wales and the Welsh language is. I remember using a very primitive database of English place names years ago and wondering where a place called Xi could be, until I remembered Ruyton. Isn't it a pity that Westward Ho! in Devon and Saint-Louis-du-Ha! Ha! in Quebec aren't pronounced with clicks? Those are hilarious names for towns. I hadn't heard of them until you mentioned them. I'm sure you're right about there being Welsh influence in Shrewsbury, but doesn't the local accent tend towards Brummie these days? I had a gym teacher from Shrewsbury and he sounded almost like someone from Birmingham to me. A friend from nearby Llanymynech has now told me that Maesbrook is ˈmeɪsbrʊk. Zhoroscop (Cristian Bodor): we do not want your respellings. Please desist. This blog uses IPA. I've often wondered whether Yahoo! is pronounced with a click or just with the Mandarin fourth tone on the second syllable. [ɘ] exists in some Englishes. It is the HAPPEH vowel. It's also the most common realization of the Polish y according to my (geographically biassed?) experience. It won't let me do cut and paste anything for some reason. "I've often wondered whether Yahoo! is pronounced with a click or just with the Mandarin fourth tone on the second syllable." "The Economist" audio edition's readers stress the first syllable, which interprets the word as an insulting noun rather than a celebratory interjection. As an English resident of Ruyton-xi-Towns, I can tell you that we tend to pronounce the more Welsh sounding places with a distinctly English inflection. the 'Ll' in Llynclys has less of the phlegmy qualities that Welsh speakers would use. The prevailing accent in Shropshire, especially in the west has heavy Welsh overtones in it anyway and you don't have to spend too long in places like Oswestry before you hear someone speaking Welsh. I think here, more than anywhere else along the English/Welsh border is the language and accent barrier the most porous. Victor Watts, in his Cambridge Dictionary of English Place-Names (2004), plumps for OE (ge)mǣre 'boundary' as the origin of the first element in these names. Happy to go along with that - but still no Welsh in the names at all.